By Jessica Wohl . Published on March 06, 2019.
" brawl that erupted between MillerCoors and Anheuser-Busch Inbev after Bud Light's Super Bowl ads poked fun at Miller Lite and Coors Light for using corn syrrup. 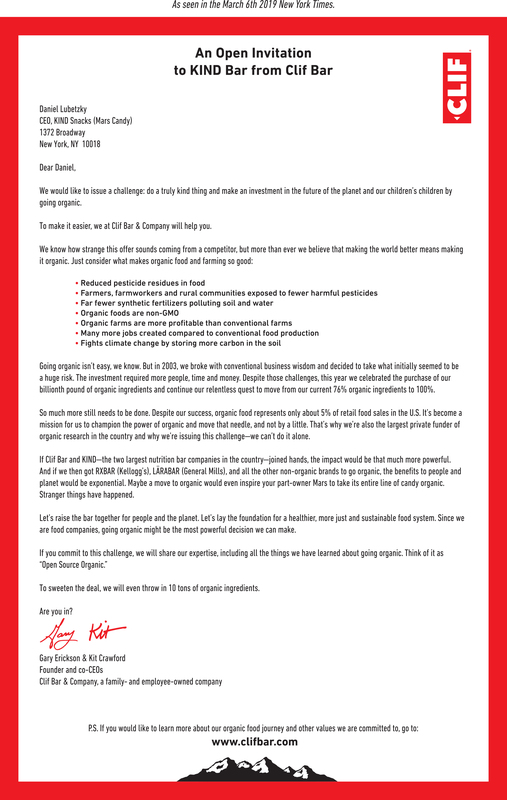 Clif Bar on Wednesday ran a full-page print ad in the New York Times as well as large online ads on the newspaper's site that read as an open letter to Daniel Lubetzky, the founder and CEO of Kind. "We would like to issue a challenge: do a truly kind thing and make an investment in the future of the planet and our children's children by going organic," reads Clif Bar & Co.'s letter, signed by husband and wife co-CEOs Gary Erickson and Kit Crawford. Clif's approach in selling snacks made predominantly from organic brown rice syrup, which is basically sugar, isn't the solution. We'd be happy to meet and share why Kind focuses on making snacks that always lead with nutrient-dense ingredients like whole nuts, whole grains & whole fruit – instead of sugar. That is why Kind's leading snack bars have a fraction of the sugar in Clif's line up. The battle spread to social media. 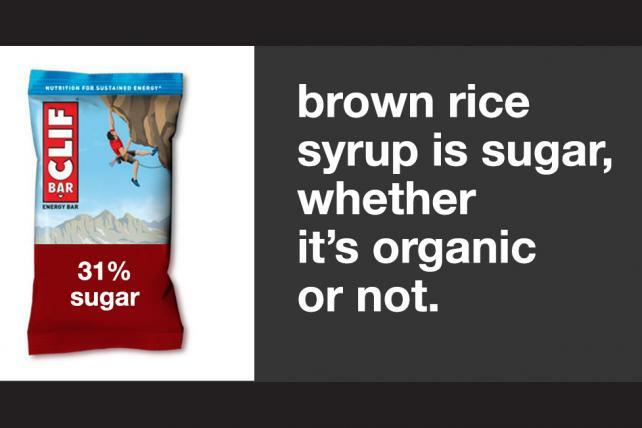 In response to a Clif tweet and Facebook post tagging @KINDSnacks, Kind posted an image of a Clif bar with the phrase "31% sugar" and copy that reads "brown rice syrup is sugar, whether it's organic or not. "Growing the organic movement is our goal," Clif Bar said in a six-paragraph statement provided to Ad Age responding to Lubetzky's comment. "If companies organically-sourced even just a small percentage of their ingredients, we could make a profound impact collectively." Still, to some consumers, sugar content matters. A quick check of two similar-sounding products—Clif's dark chocolate almond with sea salt bar and Kind's dark chocolate nuts & sea salt bar—showcases some of the differences between the brands. Clif's bar lists organic brown rice syrup and organic rolled oats as the first two ingredients. The bar contains 260 calories and 21 grams of sugar. Kind's bar lists almonds and peanuts first, and has 200 calories and 5 grams of sugar. Clif in its response to Kind's founder, referenced its energy bar varieties, saying "when sugar is used it's to provide taste and energy—we look to match the amount of sugar to the amount of energy you need." It also highlights that Clif's' nut butter filled energy bar, gram for gram, has less added sugar than Kind's nut butter filled bar. Clif also touts Whole Lotta, its newest organic snack that it is introducing at a trade show this week. Clif Bar's ad doesn't mention which organic ingredients it uses. But it does point out that Clif Bar currently uses 76 percent organic ingredients and is on a "relentless quest" to reach 100 percent. It also says that Clif is the largest private funder of organic research in the United States. The privately-held Clif, in its ad, also highlights Kind's ownership. In 2017, Kind got a minority investment from Mars. The letter addresses Lubetzky as "CEO, KIND Snacks (Mars Candy)." 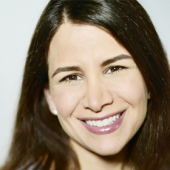 It also suggests that the two companies should team up and then try to get competitors such as RXBar (acquired by Kellogg) and Larabar (acquired by General Mills) on board. Clif Bar said it created the ad internally, with AKQA on media buying and Golin on public relations.